Many of my Christian friends are hearing about today being Pentecost… but many do not know why all these men were gathered in Jerusalem to begin with. They were there for Shavuot (the Feast of Weeks or the Feast of Harvest as it is sometimes called). It occurs seven weeks after a specific event (Deut. 16:10). Greek speaking Jews and many non-Jewish Christians call this day “Pentecost” (meaning ‘fiftieth’ because it occurs fifty days after the given day) (Lev. 23:16). Shavu’ot is said to be the anniversary of the giving of the Torah on Mt. Sinai. Based on Ex.19: 1-2 “On the third new moon after the Israelites had gone forth from Egypt, on that very day…”. Shavuot became the anniversary of the covenant, and associated with the Exodus and the Sinai event of the giving of the instructions (Torah) to Moses. 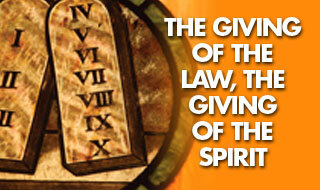 It is also when the Holy Spirit (Ruach) was given in Acts. Shavu’ot is designed as a time of thanksgiving for the early harvest. God’s faithfulness in providing the early wheat harvest increases hopefulness for an abundant fall harvest (Sukkot). Giving thanks for present provision leads to faith for future addition. It is the climax of God’s plan to provide redemption. Shavuot draws a line of connection between Exodus 19 and Acts chapter 2. The festival superimposes the giving of the Spirit in Jerusalem over the giving of the Torah at Sinai. The two events are forever inseparably linked. This link creates a profound implication for believers. The Torah and Holy Spirit are substantially of the same essence. Exo 23:16 and the feast of harvest, the first-fruits of thy labours, which thou sowest in the field; and the feast of ingathering, at the end of the year, when thou gatherest in thy labours out of the field. Exo 23:17 Three times in the year all thy males shall appear before the Lord GOD. It was still being kept by the Disciples because it was commanded. Note, this was long after Jesus had ascended. Act 20:16 For Paul had decided to sail past Ephesos, so that he might lose no time in Asia, for he was hurrying to be at Yerushalayim, if possible, on the Day of the Festival of Weeks. 1Co 16:8 And I shall remain in Ephesos until the Festival of Weeks.